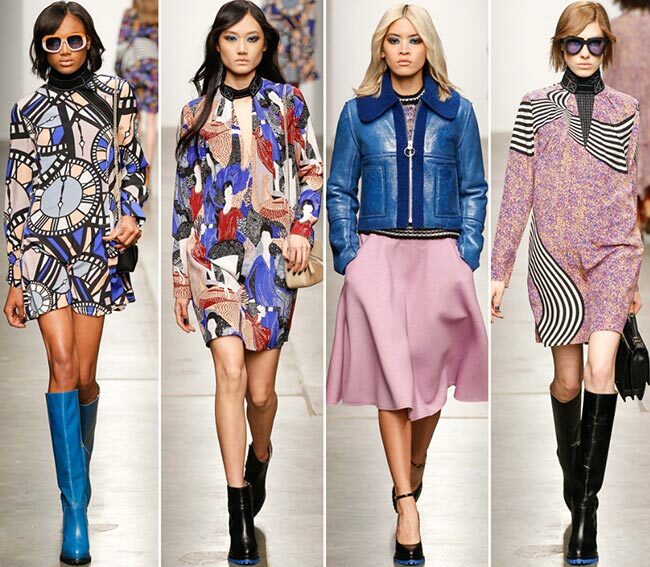 The Karen Walker fall/winter 2015-2016 rtw collection dropped a colorful bomb on the runway on the fifth day of New York Fashion Week unveiling a charming array of Seventies inspired clothes that are so easy to wear. 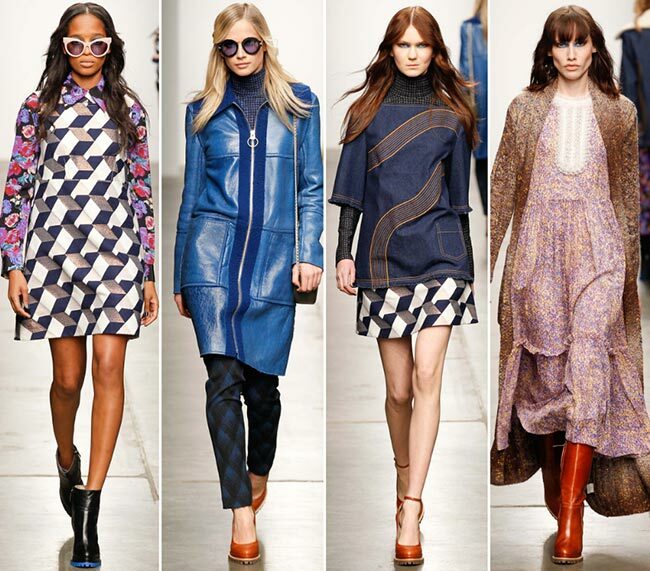 Drawing inspiration from the famous British sci-fi series Sapphire and Steel, the talented New Zealand based fashion designer sent out female time travelers to the runway, bundled in effortless and cool daywear pieces with a strong retro attitude. From the chic fall-ready color palette used to the bedazzling prints and patterns, as well as lovely details and show-stopping clothing combinations, yesterday’s Karen Walker rtw show had many aspects to charm its audience. Karen Walker has always stood out with her optimistic and effortless chic collections that put the stress on wearability and comfort. Always drenched in a high casual style, her designs manage to tell a unique story of print and color every time, showing a beautiful juxtaposition of contrasting vibes, such as masculine and feminine fashion, high-class and toned-down looks, perfectly tailored and slouchy pieces. 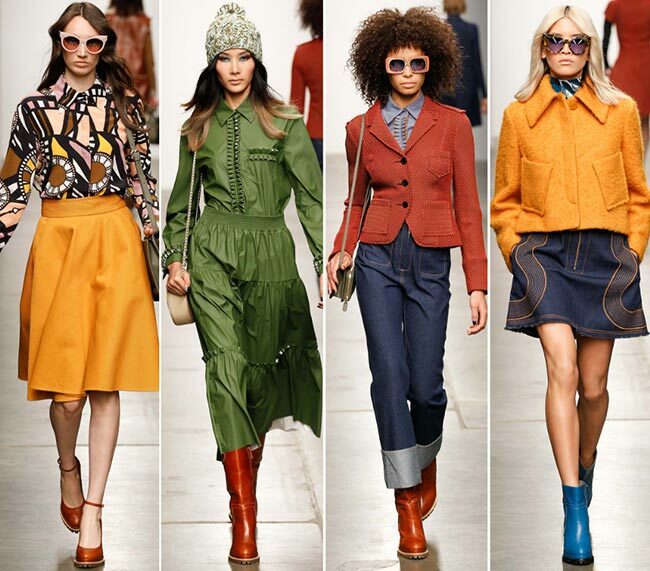 Karen Walker fashion is all about looking effortless and cool while expressing yourself through small details and unique color and print combinations that bear a certain attitude of retro styles. Charming mustard yellow is the first thing that catches the eye throughout the Karen Walker fall/winter 2015-2016 collection, bringing distinctive ’70s references and warmth and comfort to the cold fall months. It’s beautifully combined with rust, navy blue, green and brown, but there are also delicate pastel pink, lilac and purple shades coming teamed with blues, creams and monochrome blacks. The psychedelic clockface print is the signature detail of the entire line, but we see also charming florals matched with optical motifs, as well as M.C. Escher-esque graphic and artistic patterns that boosted the creativity and uniqueness of the designs. There is something ideal for everyone in the collection, whether you are into screaming patterned looks or laid-back monochrome options that place the focus on the silhouette and the charming colors used. 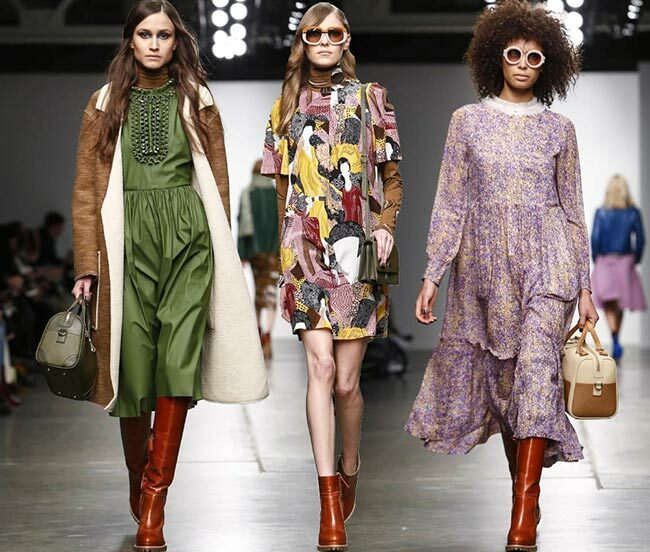 The Karen Walker fall 2015 fashion brings diversity in terms of shapes and lengths as well, targeting both the young who want to look cool in the streets and the business ladies, who want to take their office styling to a whole new level. 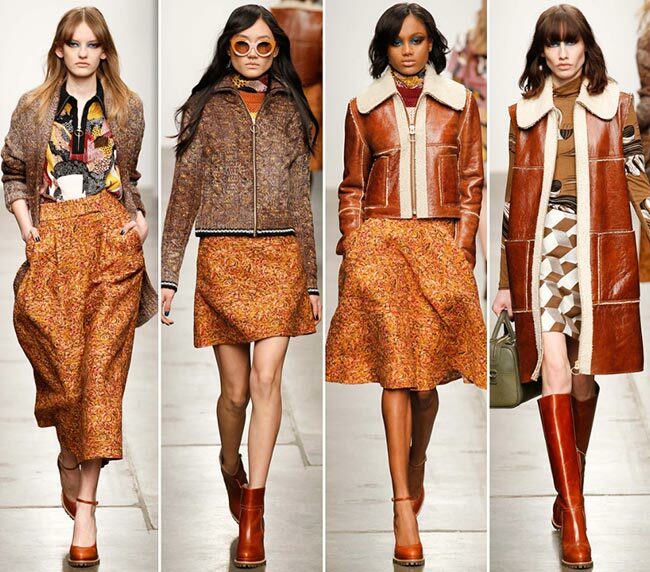 There are lots of flirty mini skirts in the Seventies style that come matched with cropped jackets and ankle booties. In addition, we love the knee-length flared skirts, both printed and monochrome worn with printed shirts, turtlenecks and zip-up jackets. The dresses come either in A-line mini lengths or cut below the knees and sometimes at the tea length, which are combined with higher boots. We also see stylish pants styles, which are either perfectly tailored matched with a blazer or stylish culottes featuring different fabrics. Denim is all the rage here, and we especially love the zip-up denim jumpsuit with a wrap-belt that can be a timeless investment for any wardrobe. 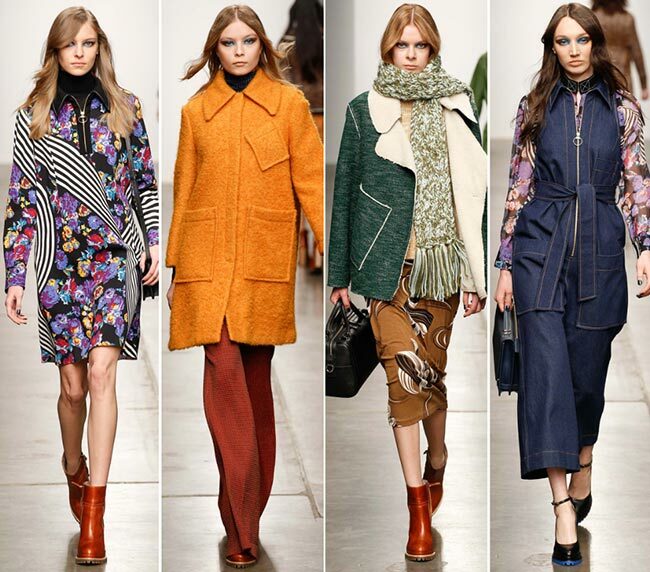 Other than that, think stylish shearling coats and turtlenecks that come to make you beat the winter cold in style. Of course, we also saw some stand-out accessory pieces, such as the multicolor leather boots, the spacious bags, the cool sunglasses and the pom-pom beanie. If the time travelers dress that fashionably, we want to change our profession right away!